Virtualization, cloud computing, and wireless technology are fundamentally changing enterprise computing, providing revolutionary gains in productivity and cost savings. Powerful enterprise applications can now be delivered to almost any device, anywhere, at any time and take advantage of tremendous computing power available in consumer devices, such as smartphones and tablets. 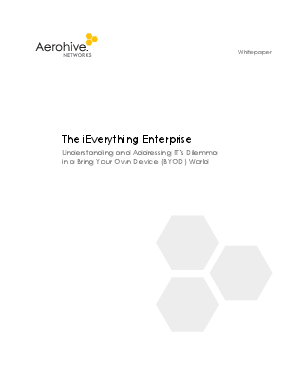 Regardless of whether these devices are corporate issued or personally owned, almost every IT department is experiencing the effects of unprecedented smart device and “Bring Your- Own-Device” (BYOD) policy adoption in their enterprise. Download this whitepaper to understand the demands that face IT organizations so that they can maximize the benefits of mobility and virtualization.